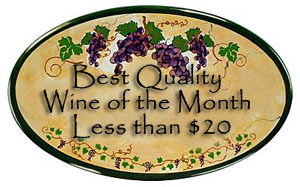 Synopsis, Our Opinion: An enchanting Syrah that would excite the palate of “ANY” wine drinker!!! Producer/Winery: Louis Barruol; Chateau de Saint Cosme; Gigondas, France. Geographic Appellation,, Region, Country: Crozes Hermitage; Northern Rhône, France. 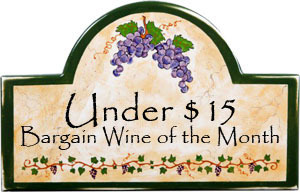 Paired With: Pan seared lamb with Madeira sauce, Anna potatoes and green beans. Opened one hour before drinking. Clear, dark garnet color with a light purple rim. Gorgeous aromas of blackberry, boysenberry, licorice and leather with occasional whiffs of lavender. Silky smooth, dry, and chewy mouth feel and a 200-grit texture. Harmonious flavors of blackberry, blueberry, black olive, and peppery spice. Fresh acidity, polished leathery tannins and a long savory mouth filling finish that just doesn’t quit. WOW!!! This is SUPERB Syrah…its audacious yet savory, impeccably balanced and an extraordinary value. It was a perfect pairing for the lamb dinner; however, it was so good sipping after the meal we both commented that “it was almost to good to drink with food”. This was truly an enchanting Syrah that would excite the palate of “ANY” wine drinker!!! Note: We opened two bottles of Syrah for a comparison tasting with this dinner. These included this wine and the Piedrasassi Anika Santa Maria Valley Bien Nacido Vineyard Syrah 2015. Raj Parr in his book Secrets of the Sommeliers makes the point that you need to know how wines from the “classic” old world regions taste so you have a reference for all the others. 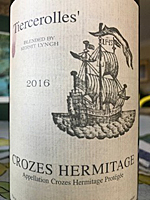 So we gave it the acid test…a side-by-side blind tasting of a “classic” Crozes Hermitage Syrah (reviewed above) and a bottle of California Piedrasassi Anika Syrah we got from the Raj Par wine club. ‎ What did we think, well in a nutshell they were both OUTSTANDING, but there were big differences. We had no trouble identifying the New World wine that had more body, more fruit flavor and a longer tasting finish, but not all the captivating subtleties of the Old World wine. However, the Piedrasassi had an Old World character and drinking it alone would have made it much more difficult to identify its origin. Photo from Chateau de Saint Cosme. 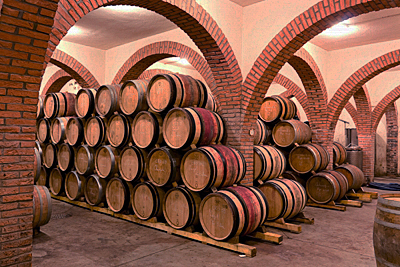 Comments: Learn more about Louis Barruol and his wines.